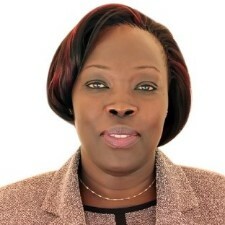 Judy Obitre-Gama is the Executive Director of Uganda’s newly formed National Identification and Registration Authority (NIRA). NIRA is charged, amongst other things, the duty of registering nationals and aliens and managing, maintaining and operating an active database that will enable better planning, security and service provision for Uganda. Ms. Obitre-Gama was Board Secretary of Uganda Registration Services Bureau (URSB) from July 2012-June 2015. URSB is responsible for the registration of civil vital statistics, business registration, registration and protection of intellectual property rights. Earlier on, she served as Head, Legal & Surveillance and Company Secretary to Uganda Securities Exchange Limited (USE). She pioneered all the above positions. Judy has served as legal consultant in legislative and policy reviews, She has engaged in training for different kinds of learners; from formal training environments like the University lecture room (Faculty of Law, Makerere University), to dissemination and training of facilitators to continue dialogue and encourage change among communities. Judy has served and continues to serve on a number of Boards of Government and non-governmental institutions. Ms. Gama is an LL.B (Hons) graduate of Makerere University and an alumnus of the London School of Economics where she attained an LL.M (University of London). She is an advocate of the Courts of Judicature of Uganda.